I will level with all ya'll. I am not a soccer fan. In fact I do not like soccer. I know, I know - it is a popular sport around the world. And I am not trying to offend people who enjoy it. I don't. So it may seem odd that I am doing a preview for PES 2011 3D. It will seem even odder to realize I will be doing a review of this Nintendo 3DS title. 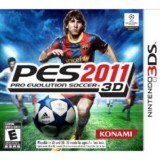 What I can tell you is that PES 2011 3D will get a fair shake. I purchased this game, and feel like I got my moneys worth out of it.